This PDF tutorial guides you step-by-step to setting up your own free giveaway book and download delivery. No, it isn't WordPress. 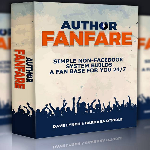 It's a little-known online platform where you create an author account and send out a free download to your sign-ups.